Editor’s Note: The following submission is Devon J. (’16)’s work on ALS for science research. ALS or Amyotrophic Lateral Sclerosis is the result of astrocytes losing the ability to nurture motor neurons (MN’s) and thus resulting in the degeneration of motor neurons and the atrophy of the body’s muscles. Once ALS is diagnosed there is no chance of recovery and death is usually caused by not being able to breathe due to the degeneration of throat muscles. ALS research is now focused on finding a biomarker (an indication of the onset of a said illness that can be measured accurately and reproducibly) (Strimbu & Tavel, 2011). Superoxide Dismutase-1 (SOD1) is an enzyme encoded into our 21st chromosome that when mutated has been linked to the onset of ALS. This article written by the lab I’ll be working at over the summer looks to see how much of a role a mutant SOD1 enzyme plays in the degeneration of astrocytes. Besides where SOD1 is located what does it normally do in our bodies? 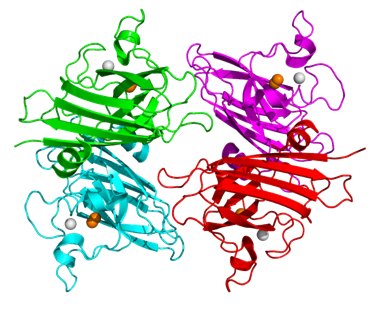 Well, SOD1 (picture below) is a free radical that destroys superoxide radicals in our bodies. Superoxide radicals are beneficial to our bodies as they combat illnesses, the thing is, they’re extremely toxic and we can’t have them sitting in our bodies not doing anything or they’ll make us sick, so we have free radicals that break down our superoxide radicals into something less toxic that our body can handle (Milani, Gagliardi, Cova, & Cereda, 2011). SOD1 enzymes in their normal coiled state, mutant SOD1 enzymes often are depicted as uncoiled. 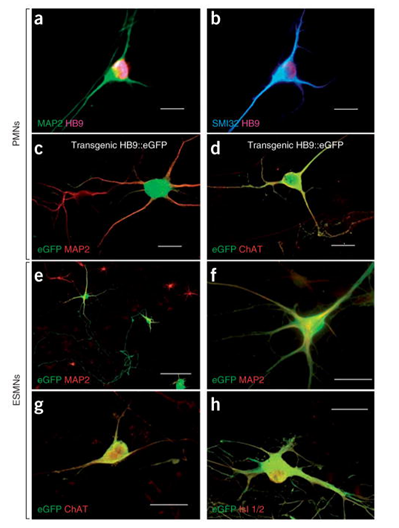 The lab cultured motor neurons and astrocytes from embryonic spinal cords (PMN’s) and embryonic stem cells (ESMN’s) from 12.5 mouse spinal cords. They then bred mice to contain three different variations of SOD1 (SOD1G93A, SOD1G85R, SOD1G37R). Cells were prepped by simulating the mutant SOD1 process by plating or infusing astrocytes with the three variations of SOD1. They looked at these astrocytes under a high powered microscope over a period of 14 days and looked at the morphology of the astrocytes meaning its cell body diameter and the axon length, the arm like things that connect the astrocytes to the MN (below) ("Morphology (biology)," 2014). They then wanted to see if these mutant astrocytes released neurotoxic factors. PMN’s were cultured with SOD1G93A and left to culture for 7 days. After that time they counted the amount of PMN’s left. The results showed in graph A below show how the SOD1 enzymes directly correlate to the toxicity of astrocytes. Astrocytes treated solely with nitroglycerin had a significant amount of astrocytes remaining than the wild type astrocytes (natural astrocytes) and the ones plated with SOD1G37R. Graphs B and C show the same thing in the form of cumulative frequency basically meaning a running total of the cell body diameter and axon length. The graph below shows the amount of PMN’s left after being frozen. 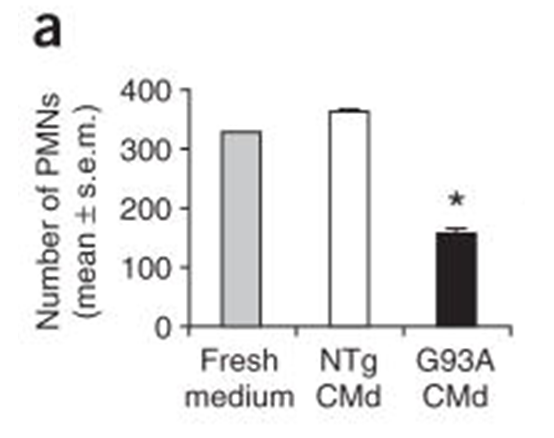 The graph for the remaining SOD1G93A is significantly lower than the other two controls showing that the SOD1 enzyme had a major role in the degeneration and atrophy of the PMN’s.